Editor’s Note: Over the past three days, Dave has been reviewing the last month of Impact Wrestling action in anticipation of Thursday night’s Genesis Free-for-View (or whatever it is they call the things that used to be PPVs that they were losing money on). Here’s Part Three: the 1/9/2014 show. In an opening segment showdown, AJ Styles continued to look confident and unafraid in the face of Dixie Carter. As I said with last week’s show, Styles has used this last run to cement his value as a main event babyface. Magnus also used the opening segment effectively, cutting a serious, competitive promo on A.J. Gunner and Storm’s promo face-off was another solid, logical step in the journey that is their feud. Both men seem determined that they are the best man, and each play their part very well. It was refreshing to see two men in the ring announce an important match and not immediately go into a beatdown. Kurt Angle faced Bad Influence in the cage as a tune-up for his match with Bobby Roode. 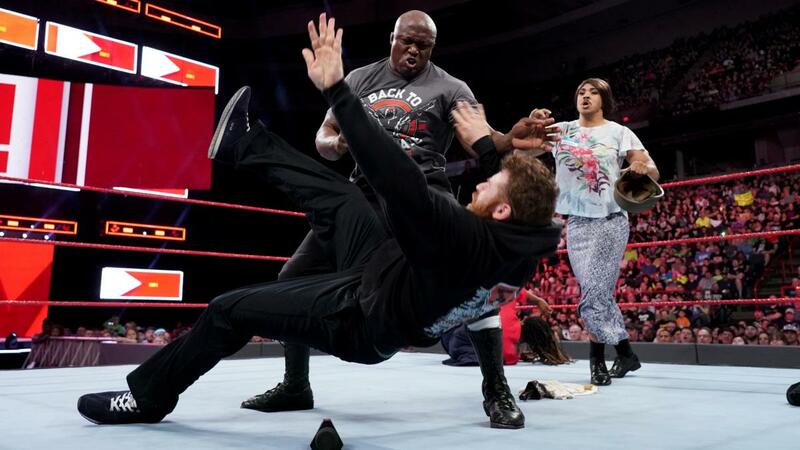 I had some objections to this based on principle (see below), but the match did a good job showing that Kurt Angle can still work a crisp pace and keep up with much more athletic wrestlers. Everybody in this match was a good worker, which always helps. When Dixie announced the Styles-Magnus main event as no disqualification, I’m sure a collective groan echoed across the landscape from anybody who’d ever seen a wrestling match before. The Joseph Park/E.Y. vs. Bromans match was going totally fine… until the backstage beatdown on ODB that led Young to leave ringside. Moves like this give bookers outs from presenting straight-up matches, but I don’t know that they’ve ever successfully gotten heat from the audience or helped out anybody’s character. More importantly, if the Bromans and the TNA Tag Team Titles are going to survive, the champions need more serious competition than lower-midcard clowns. I’m sure there are worse ways to use Samoa Joe than taking a beatdown by ECIII and Rockstar Spud… but they escape me. Bobby Roode’s cage match with Sting was supposed to show that he was a worthy opponent to Angle, but instead it just made him seem like another generic TNA heel who needs help from Dixie’s crew to get a win. The worst part of this match was that it felt completely pointless. It would have been better for Roode not to wrestle a match on this week’s Impact than to have this match. Rockstar Spud and ECIII got involved in the main event about two minutes into the match, leading to me nearly putting my fist through the wall. You’d be a fool not to expect them getting involved in the finish, but it’s unbelievable that TNA wouldn’t at least put on some kind of a straight-up match before the gimmicked silliness commenced. The “Entire Heel Roster vs. A.J. Styles” match was a colossal disappointment. It would make sense to stack the odds against Styles, but the overbooking prevented Styles and Magnus from having the memorable match that would have elevated Magnus as the new, undisputed champion and set up a huge return for A.J. Styles whenever that happens. Considering that this show was built around what was supposed to be an undisputed title match, it was godawful. The non-match between Styles and Magnus just about the most anti-climactic, disappointing thing that TNA possibly could have presented. In terms of Genesis, this show continued the fantastic build for Storm-Gunner, but dropped the ball on the Roode-Angle angle. Honestly, the match would have been better off had they ended on last week’s show rather than putting Angle in a handicap match and giving Roode an unnecessary dirty win with the help of Spud and ECIII. In fact, that seemed like the theme for this show: it was a much worse go-home show than last week’s episode would have been. For better or worse, a lot has happened in TNA over the last few months. Magnus has emerged as a legitimate heel champion, young wrestlers like Gunner and ECIII have risen to prominence, and TNA has pared down the roster to a tight core of stars you’re going to see on Impact every single week. Having watched these three episodes in quick succession, I’m finding the Gunner vs. Storm match the most intriguing contest at Genesis. Storm has done his thing cutting incredible promos, and Gunner seems to have taken things to a new level both on the mic and in the ring. Their feud has escalated in a logical, step-by-step manner, and the result of their match will have important implications for the World Title. Magnus is coming into his own as champion, but I can’t help but think his showdown with A.J. Styles was a huge missed opportunity to put him over as a killer heel. It’s an unbelievable mistake to keep the heat on a non-wrestler like Dixie Carter an her hapless lackeys rather than transmitting it to a young heel champion like Magnus, who’s a capable wrestler with a good look and above-average talking ability. The last three weeks of TNA Impact Wrestling set up this week’s Genesis show, but they also perfectly illustrated the main conundrum for TNA heading into 2014: Is TNA a wrestling company owned by Dixie Carter, or is it a Dixie Carter company that features wrestling? Reviews of last 3 #ImpactLive eps headed into #TNA #Genesis. RT @DaveTheMark: Reviews of last 3 #ImpactLive eps headed into #TNA #Genesis.